* Please note that the town has made the decision to enter into negotiations with the TreeGo company, using a different piece of land than originally proposed. Earlier this week, I sent the following letter to our Mayor & Town Council, expressing our Support of the proposed “TreeGo” in Victoria Park. As residents & business owners in the Town of Truro, we would like to express support for the proposed “TreeGo” in Victoria Park. Eco and Adventure Tourism are among the fastest growing sectors of the Tourism Industry and we firmly believe that this tourism product proposed for a portion of the park would assist in making our Town a “destination”. Tourism is the number one industry in the province and Truro cannot afford to miss out on a chance to increase both our visibility and the overall financial impact of having such an attraction in our area. This venture will help put both the Town and Victoria Park on the map and will keep people in the area longer while spending more money in the community. We are excited to see something so unique coming to Truro and wish the project well. In my opinion, it is well-worth the watch, highlighting the inter-connectedness of our two great countries! Well done NBC! I volunteer in our son’s classroom on Thursday mornings. Yesterday, they were working on projects which involved picking a country and finding out information about that country’s past & present participation in the Olympics. While his classmates chose countries like Canada, the US, Germany, France, etc., Evan chose Latvia. (Geography enthusiast.) While they were researching “their country” on the school’s laptops, one of Evan’s classmates called me over. Once there, I type: “belgravia bed & breakfast truro ns” or “5 Broad Street Truro NS” into the search bar. The town view with our location fills the screen along with a bubble containing our information. One of the links you can click on is, “Street View” which takes you an image looking down Broad Street from the north-west corner of our property; our driveway is the first on the left. Using the cursor, you can scan our property, see the chairs D’Arcy built which sit in the shade of the trees, and almost see inside the front door! I was looking at it through eyes as if it were a surprise inspection. I think this service will be a wonderful thing for the traveling public. Most of the time, operators put their best photos on their websites, and perhaps their properties have run-down over time. This gives you a true idea of what the area you will be visiting looks like. Are the houses right on top of one another? Is the property well-maintained? Are there really restaurants & attractions “within walking distance”? Now you can see for yourself! Our Valentine’s Dinner was a great success with fun groups of people each of the two nights. The food was incredible and we thank Dan for providing such a beautiful meal – one couple enjoyed it so much that they’ve already booked for next year! Another couple stayed for two nights and we combined our ski package at Ski Wentworth with our Valentine Dinner for them. They spent the day skiing in the sunshine with ideal conditions and then had a private romantic anniversary/Valentine dinner in front of the fire. They’re thinking of making this an annual event and we hope they do! Now that Valentine’s Day is over and it’s starting to get brighter in the mornings, I’m starting to think about Spring & Summer! We’ve been dreaming up some fun new warmer-weather packages, so stay tuned! As I’ve mentioned before, we are so fortunate to live so close to the Bay of Fundy. When I was in university, I had a chance to take a train from Amsterdam to Berlin to visit my “sister”, an exchange student who had lived with us while I was in Gr. 12. On the train, I struck up a friendship with a boy from Iowa and was stunned when he revealed that he had never seen the ocean! It had never occurred to me at that time that there might be (many) people in the world who had never seen the ocean. I certainly don’t take it for granted anymore! 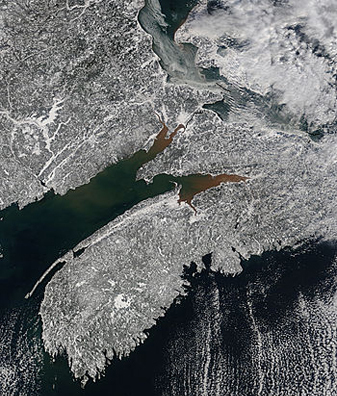 Two days ago, NASA’s “photo of the day” was of a snow-covered Bay of Fundy. Awesome! We are located in Truro, at the "V" where the silt has built up. The Bay of Fundy, right in the heart of Canada’s Maritime provinces, is a 270 km (170 mile) long ocean bay that stretches between the provinces of New Brunswick and Nova Scotia on the country’s east coast. It is currently a Top 28 Finalist (Canada’s only representation) in the global “New 7 Wonders of Nature” campaign. “I am so excited that the Bay of Fundy is representing Canada in the contest,” stated Mr. Tupper. “Through its online voting campaign so many more people will discover and appreciate the extraordinary natural wonder created by world’s highest tides. The Belgravia is a perfect stopping point to base yourself for exploring the Bay. This Fall, I spent an afternoon exploring the north shore of the Bay. You can read that post and see a few photos from my day here: A day on the Bay of Fundy. The link to vote for the Bay of Fundy as a New 7 Wonders of Nature can be found here: Vote! I think this is a wonderful idea for tourism in Truro! Victoria Park is a 1000 Acre park here in town, filled with beautiful, well-kept walking trails, waterfalls, picnic tables, a barbeque area, an outdoor swimming pool, and playground. Years ago, when I was growing up, people were even able to camp in the park! My initial thoughts are that this would be a great draw to increase awareness of the park and draw more people into the Town of Truro!